In this article, we’ll be discussing potential first YouTube video ideas. We’re going to try and cover all the things that you can do from day 1 as a new channel, or that you can even choose to do now to launch your channel. Our list of potential first YouTube video ideas will be divided into four sections, with 25 entries each. The sections are, as follows: General, Gaming, Howto/Education, Technology. General will cover general ideas, though plenty of them will be relevant to Comedy and Fashion YouTube. Gaming will exclusively cover Gaming YouTube video ideas, while Howto will dive into all the different ways to do tutorial/educational content on YouTube. Finally, there’s Technology. That’s a special one that encompasses a lot of different areas in today’s world. Of course, you may be asking yourself already: What about the remaining 1 idea? 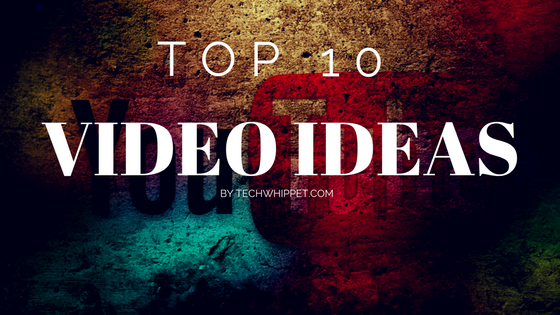 This is a list of 101 First YouTube Video Ideas, not 100! And you would be right! The last one is a secret. Save it for when you’re done reading the whole article, or the section(s) relevant to you. Who are you? What do you do? What’s the first thing people should know about you? This is the video where you answer those questions. Did another YouTuber make an opinion video? Maybe you disagree, and you’d like to make that known. Response videos are more likely to be seen than a random comment, and yours might just pick up steam for you and your channel! Vlogs are popular. Basing your channel entirely on vlogs won’t do you well in the long run (in most cases), but starting with a vlog will give your fans something to look back on later, to see how you got your start. Opinions. Hot political debate? Think Final Fantasy VII is overrated? Go ahead and say it! Did someone do the Cinnamon Challenge? Did you catch it on camera? Did they die? If the answer to the first two questions are “yes”, and the last is a “no”, post it! Take a product or show or episode or movie or something and review it. People like hearing what other people think about things, especially if they’re on the fence about buying or seeing something. 7. What’s On My Phone? Everyone has apps on their phone, but no two phones are the same. What apps do you use, and why? What’re your favorite movies? Talk about your favorite movies and why they are what they are- this is a great way for people to get to know you. Mine’s Hot Fuzz. What’s your favorite sport? Discussing a favorite sport can establish a quick relationship with the viewer, especially if it’s something as popular as Basketball or Football. Do you love Atlanta? Watch it if you haven’t. But also, talk about your own favorite TV shows! People on YouTube love to laugh, and chances are you’re no different. Grab a camera and some friends to make something funny happen! Maybe you want to make a video series, like a TV show or comedy series, hosted on YouTube. If that’s what you wanna do, go ahead and make a pilot! Just got back from the mall and want to show off all your swag? Go right ahead and do that with a haul video. The bigger, the better! Collect bottlecaps, baseball cards or vintage postal stamps? Showing off a collection of items you hold near and dear can make a good impression on your viewers. Saw a video that resonated with you? Might as well make fun of it. Sing a song, any song! Just don’t try and monetize it. “Friend videos” are popular on YouTube, especially if made well, because they make viewers feel like they’re a part of a group. If you can take a camera along on a day out with friends and do some good editing, your viewers will feel like they were out there with you! A person’s room says a lot about them. Clean yours up before you do this so they don’t know how lazy you are. People don’t consider this often, but on the macro scale, not a lot of people live in your hometown. The ones that do and happen to be on YouTube probably haven’t made videos highlighting it, but you may well be sitting on a goldmine of interesting stories to tell. So do it! Have a memorial of a deceased family member, or a plush toy you’ve had since you were a kid? Show it off, and tell us the story behind it. Product reviews are always cool. Go for a formal approach with these, and try and properly tag/describe/title it, so people looking for reviews on that product can easily find yours. Make a quick channel intro that outlines the kind of thing you’ll be doing on your channel. It’ll need to be unlisted so people don’t stumble on it, but once you start making more videos, you can have your channel intro on your channel page to earn you a few subscribers. Everyone has a favorite album. What’re yours? Raw gameplay is just footage of you playing a game, with no real editing or additions on your part. It’s dull, but sometimes it’s what people are looking for. Keep reading for some better YouTube video ideas. Other times, people might want to see the story bits of a video game without playing the actual game. That’s cool. Record and post the cutscenes for them to browse! The quicker you are to this after a game’s release, the better. Walkthroughs are cool. It lets people watch how you learn and experience the game, as well as how to get past certain challenges they may not be able to figure out on their own. A speed run is a full playthrough of a game done as quickly as possible, often skipping many levels to reach the game’s ending. A popular example can be seen by using the Warp Zones in Super Mario Bros to get to the last Worlds quickly. People spend actual money on video games. Because of this, they might want to know about a game before they buy it- so feel free to make game reviews! You’re helping out your fellow gamers by doing so, and may get some popularity if you have a good rep. Sometimes, gaming is about the little things. Where did Mario get his name? What’s the last level of Pac-Man? Find interesting gaming trivia to present and share! These differ from reviews, and are more for people who have already bought the game. The best example of this kind of video can be seen in Super Bunnyhop’s Critical Close-up series, where he explores a game’s gameplay, themes and more as in-depth as possible. Many games have advanced mechanics that are difficult for newcomers to learn. Make a video demystifying these, if you know how to do them! Any game with a competitive scene has its best and brightest. Find the people who are best at your favorite game, and make a video discussing them. Mario and Sonic, apples and oranges…the debate rages on. Find two interesting games to compare side by side. A machinima takes gameplay and voice acting and presents it as a show, typically a comedy show. This is actually pretty old as far as YouTube video ideas go, since this kind of thing was popularized by Red Vs Blue over a decade ago. Record gameplay, edit it together to highlight funny moments, add commentary, and voila. Some games support modding- the addition of custom content. Make a video showing off your mods and how they change the game! If you’re a PC gamer, you enjoy customizable hardware and customizable games. Show off games at their highest possible settings, that would bring a console to its knees! Love some indie darling that came out on the PS1 in Japan only? Talk about it and spread the news. Certain developers are interesting to follow in the gaming industry- think Hideo Kojima or Shigeru Miyamoto. Find an interesting developer and share their story. Gameplay reaction videos are huge on YouTube, popularized by PewDiePie. No harm in trying it out for yourself. Liv ecommentaries are an enjoyable form of gaming content, too, especially if you edit it down to the most interesting moments in a playing session. In competitive multiplayer titles, frag videos are popular for showing off skill. Just stitch together your sickest airshots/headshots, put on some pounding music and put it on YouTube! A longform first impressions video, like reviews, are great for letting people know what to expect when they buy a game. TotalBiscuit is particularly known for this with PC titles, and many people watch his content to get a feel for what they’re buying before diving in. Discuss the latest in gaming news, like when is the NX coming out? Discuss the oldest in gaming history, like what happened to the Virtual Boy, anyways? Remember that Mario/Sonic crossover being developed in 2002? Liar, that’s not real. There are plenty of equally crazy game ideas that never came to be, though- find evidence of their existence, then share that with the rest of us! Emulators can be used to emulate a game from an older console on PC. Making videos showing off emulator progress or performance is well-loved by the emulation community, and could very well earn you a few points. What happens next? YouTube video ideas like these are up to you! Have an old family recipe that you’d like to share with the world? A great YouTube video ideas would be to show people how to cook it. What do you do for a living? What do you for fun? Talk about these topics and their history! Are you really, really passionate about the Edo era of Japanese history? Dive in and talk about it, or something else you’re passionate about. Why are we here? Does life have meaning? 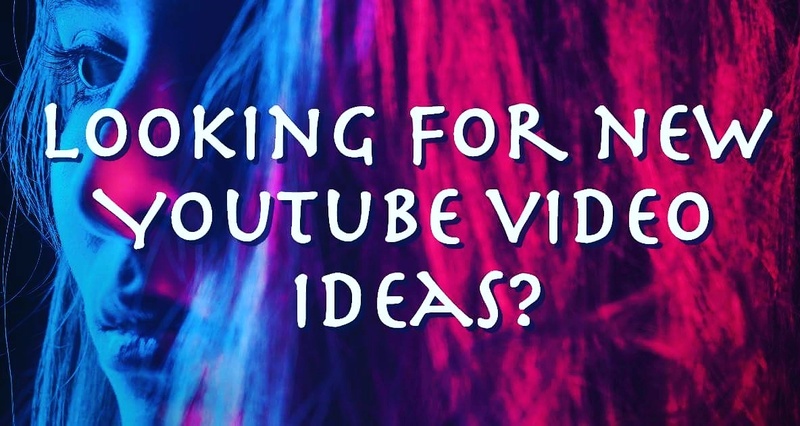 This list of YouTube video ideas can’t answer those questions, but you can! Let’s face it, many people have had issues dealing with the much-hated Math over the years. If you know how to do it, make a video simplifying it for them! Shakespeare, Sun Tzu, you name it. These men have storied history, so to speak, so don’t hesitate to explore it! Do you know how to change a tire? Some people don’t. Teach them how! Do you know how to put your tongue on your nose? That’s gross, but you can totally make a video on it. Make a random object on your desk disappear! Wait. No. That was my wallet. We don’t mean be a news channel- instead, dive into historical context and scientific discussions about current news. If fighting is sure to result in victory, than you must fight! Sun Tzu said that. And I’d say he knows a little bit more about fighting than you do, pal, because he invented it! Talk about how your favorite books were influenced by authors who came before them. Talk about master filmmakers like Tarantino and discuss their influences. Dive in deep to the latest on the small and silver screens. Be that unbearable hipster who keeps trying to get people to listen to his mixtape at Starbucks. Make a biographical video on an interesting historical figure. Tired of children in your actual house? Build a treehouse and show other people how to do it so parents everywhere can take their children and put them somewhere else. Many people have difficulty managing work and play. Teaching people organizational skills and timekeeping sound like pretty great YouTube video ideas to us! Contrary to what people believe, they don’t typically know how to take care of animals that aren’t a cat or a dog. If you’re an expert with animals, use these YouTube video ideas to teach people proper treatment and care of various animals. Talk about the latest in Beaver Dam™ technology. Unfortunately, we live in a world where people don’t know how to use a lot of essential tools. Fix that. You could probably use the weather for different YouTube video ideas each day, but go for something more interesting. Talk about climate regions. Mythbusters isn’t on TV anymore, but that doesn’t mean there aren’t still myths that need busting! Take it into your own hands, and try not to get yourself hurt blowing things up in the process. Our YouTube video ideas are great, as long as you don’t get yourself hurt. If you’re a techie, you like knowing people’s specs. Use these YouTube video ideas to show off your own! If you have a laptop or tablet, don’t take it apart. You can still talk about its specsheet, though. Make a review of your smart device! These are popular, especially if it’s something new and on the high-end. Own a Smartwatch? Has it changed your life forever? Use this YouTube video ideas as an excuse to talk about it! Remember what we mentioned earlier in the gaming YouTube video ideas? Speculation. This one is full of YouTube video ideas- from processing architectures to GPU manufacturers, tech is full of interesting stories to tell. Find them and tell them! The latest hardware always gets people going. Capitalize on these YouTube video ideas to talk about the next generation of computing. Gamers often crossover with tech enthusiasts, so tackling the latest graphics cards is pretty good as far as YouTube video ideas go. Test your computer against high-end games and productivity applications. This will allow your viewers to compare their computer horsepower to yours! There’s a lot of tech lingo that people don’t know. Use these YouTube video ideas to fill in the blanks! If you’re using, say, the Windows Insider Program, use the beta release to your advantage by making a video on what people can expect. This is also popular with Android phones whenever a new version of Android releases. Do you have gossip-worthy beta access to an app or a site? You’re looking at YouTube video ideas, so share it with the world! Audiophiles are a neglected part of the tech community. If you can make quality content that appeals to them, they’ll come to you in droves. Got a sick new mechanical keyboard, or a mouse with a DPI higher than any number you can concieve? Make a video talking about it! If you have a gadget and run a tech channel, review it. YouTube video ideas like these should be a no-brainer, but we’re emphasizing it anyways, since they’re important for growth. Sometimes people have a unique question about computers or technology. Answer it to the best of your ability, and see what you can find out on the way! Can you believe that people in 2016 still don’t know about Windows keyboard shortcuts? Make a video on all the little ways you can use a computer better and more efficiently. What’re your favorite apps and programs, and why? Use these YouTube video ideas to explore that! We all like to think about what we can’t have. You can, too. Setting up a computer or desk or server can be tough. Making a video showing off how to do that could help a lot of people. Linux Mint is pretty cool. Make a video about Mint or another distro that catches your interest! Remember what we mentioned about Linux? Making a video about adapting to a new operating system is one of our favorite YouTube video ideas. If you’re a PC hardware enthusiast, you’re gonna watercool your rig eventually. Document that on video! Install a bunch of viruses on an old machine, or literally destroy your computer. That stuff gets views- just make sure you have a spare! SSDs and HDDs are a big deal in technology. Talk about the latest advances in storage capacities and pricing. Last but not least, make sure that you come prepared. You can’t walk onto the YouTube scene without having at least a vague idea of what you intend on doing moving forward. Now, your first YouTube video idea isn’t going to come out exactly how you want: inexperience means that you’re always going to slip up, and that’s usually okay. 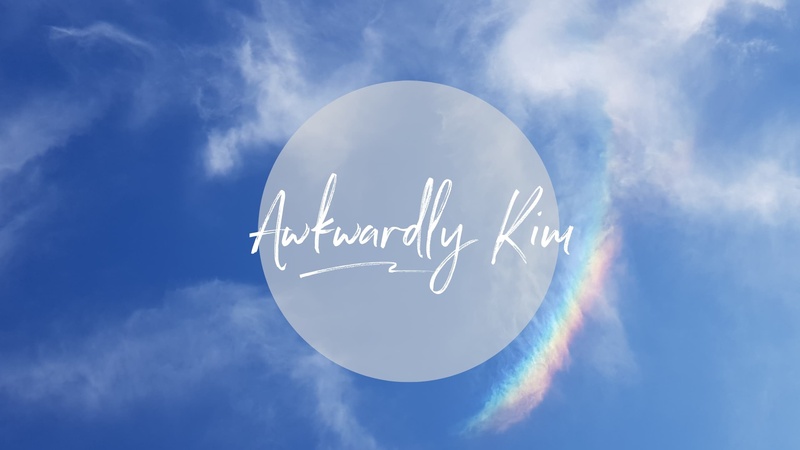 People find slip-ups and mistakes from first-timers endearing, since they haven’t found their voice yet, and typically enjoy going back to the first videos of their favorite YouTubers to see what they’ve grown from. For the people who find you after you release your first video, you have to show your potential. You have to put forth your best effort and your passion into what you’re doing and how you’re doing it. They need to enjoy your video not just for what it is, but what it could be if they choose to stick around throughout your growth as a YouTuber. This can be challenging, but we can help you. Here at Grin, we champion YouTube content creators in two ways: by providing access to a awesome sponsorships from brands and a free, regularly-updated blog. Our blog, meanwhile, is a free tool that you can use to learn how to get ahead on YouTube. For more on that note, stick around. Nice discussion. Thnaks a lot sharing such a helpful post. I think they will be benefitted who are searching niche to make video. How about you learn to spell section right? Hey man do you mind if I try that? Feel free to check me out @ “Angela Nicole Chu”! I’m currently at 755 subs and aiming for 1000 by June! I will subscriber to whoever subscribe my YouTube channel with my 3 accounts. Everyone subscribe my channel. Reply down °done° so i can find yiu easily. Hi, I’m Priscilla Hibbert! You can subscribe to my channel on YouTube for vlogs, playlists, music videos, and more!! Please check out my new channel, I’m desperate lol. I’m working on improving myself to be less awkward in front of camera. I’m trying to get at least 1 sub for now. My Youtube Channel is Charlotte Elizabeth. I only have – like – 15 subs. My blog is called The Daily Rant. hey guys! Brandon from Grin here! Thanks for all the comments 🙂 Keep em’ coming! Hey y’all! Been doing YouTube just over a year and am trying to get to 100 subs. Would be awesome if you checked out my channel! Search Ashton Hardy and it’s the very first one the pops up called smASH. Just started creating youtube videos. amy butcher on youtube! sub! Check out my channel and subscribe if you’d like! PLEASE LIKE AND SUBSCRIBE TO MY CHANNEL WITH A GIVEAWAY OF STEAM CSGO ACCOUNT !!! Check out my channel !! We make entertaining challenges ,Vlogs and rants. Hey guys it would be great if anyone could check out my channel. I’m really shy about sharing it with my friends but I just prerecorded some better quality videos and I’d love you grow my YouTube family. If you like song covers and art please check out my main channel Julia.AML. https://www.youtube.com/watch?v=yy0ZRJrzeo0 hey guys watch out this channel where you will get information on every thing.just started it. Hey guys, check out my video challenge! If you like Shameless Maya, you’ll love this!! Gave me some ideas for my YouTube channel! Sub here if you want to: https://www.youtube.com/channel/UCXcYXI3yysGFi5Y9sCzztfA. I will definitely have better ideas in the future! Check out my channel and maybe find something you’d like! I’ll go sub to your channel right now! There’s so many channel with this name, which one are you? I love these ideas I’m going to San Diego and these ideas are perfect! Hi! Please help me get more subscribers and I am starting vlogging soon, just not a exciting outside life and my siblings don’t know except my parents and sister .. eheheheh. I’m @ Lily lu! My newest video is a diy origami heart! i would be starting up a new YouTube channel and its my first time and i don’t have any you-tuber around, so pls i need all the support i can get from guys. please go and subscribe to my channel, its called Renee_kasi….plsssss and thank you very much. I have a little over 100 subscribers and my channel is labeled as a Gaming, Math, and Science channel, but I want to make weird videos like bill wurtz or FCCD. I think those videos are really funny. Hey I created my channel a week ago, only have 7 subscribers and it would be really cool if you could check my channel out, it’s about vlogs, gaming(coming soon), and challenges! Just hit 100 subs!! Going to start playing with my subs in livestreams soon! Hi I am not really that good at youtube and stuff and don’t have many subs, so if you could sub to me please that would mean so so so much to me. So I just started a YouTube channel just the other day ( @ Nonchalant Carm) and I have only one subscriber. I would greatly appreciate it if you subscribe to me, I’ll subscribe back!!! I would love to see your videos! Would love to have some feedback on my content people! Let me know what I could improve on please. thanks for the ideas, i have some skills like website development and can also make how to videos , thanks you are doing great here are some different skills i can do on http://www.scrodat.com please message me where to start first .. thanks for the amazing post . https://www.youtube.com/channel/UCa7IK1oaLnhvTxXAqrRJJCA/videos?view_as=subscriber I NEED SUBSCRIDERS!!! AND IDEAS!!!! Hi every one i am new Youtuber, i want to visit you all to my channel. Please give me suggestion, ideas and you can also subscribe my channel if you want. Please Visit my Channel. https://www.youtube.com/channel/UC3ODjlNlWqfJL3rfrNmwTPg?view_as=subscriber This is my channel. I hope you all will visit. If u sub me i will subscribe your channel back its promise. So i just wanna know how do you help someone new interested in joining youtube??? I think he meant you should tell your opinions to your friend on why he should join Youtube. well, you can help them create an account and you can help them come up with video ideas. Does that answer your question? Look good. I would love to get this one out. Thanks. I have a couple videos up and am hoping to get a few comments for more ideas on videos. I subscribed to you! Could you do the same for me? Subscribe to. My channel plzzz??? Make sure to subscribe for awesome videos every 2 day! Hey since everybody here is starting out, check out my Chanel and I will check out yours, and im happy about every new subscriber! Sorry for the late response I had completely forgot about signing up to here. Returned favour thank you! Thank you, favour returned Done! https://youtu.be/tr80M2dz7mk subscribe for the subscribe? https://youtu.be/g_wNIXEIjEM love your videos church mine out and don’t forget to subscribe. Just subscribed to yours. Here is my channel and I will happily check out others and give feedback. Very good channel your doing awesome! Great ideas will definitely be incorporating some of these into my channel. Technically it’s not the best way considering some people are starting new and don’t have fans. If you don’t have fans you still have a lot of friends. You can use videato to get ideas from your friends. You can also get noticed by other YouTubers by sending them some ideas. They can promote you. Subscribe to my channel and I’ll subscribe to yours! I’ll check yours. Do not forget to subscribe. https://www.youtube.com/channel/UC8jKVdYmudlL8RjcwFSzsPw – you’ve given me some new video ideas, thank you!! Subbed! please sub my channel in return. Tons of great tips here, but what about Unboxing videos? My last video is UP !!! Since you’re here watch my first ever vlog! I’ll subscribe to you if you subscribe to me! It would mean a lot thanks guys! A very big big thanks to This awesome article writer, thanks for sharing with us, it gives a tons of ideas to do some good on YouTube. Thanks a lot. Hey! Can you check out my channel and maybe subscribe? I am working on a new video, and it will be fun! Hi, would like some people to check out my channel. Any subscribers will get a sub back!!! If you don’t subscribe, I’ll kill you with a machete. Check me out and I will do the same for you! Feel free to check out my Bad Driving UK videos! Highlighting some of the terrible driving we have in the UK. All from personal experiences! Feel free to follow if you like! Don’t want to be negative, but a good 90% of all your points won’t pass the new youtube monetization review, just saying. My channel is called Buggy Z and I’ve had my channel over a year now but I only have 20 subs. My friends have one and did for 6 months and have over a thousand. I don’t know what i am doing wrong. I’ve tried sub for subs, I’ve tried telling people but it still doesn’t work. What do I do? Hey guys! Please check out my video! Hey I’m a new YouTuber and I want to get off on a good foot so if you could sub to my channel that would be very appreciated! I need more subscribers for my channel. Please subscribe. Having a Hot Chocolate Challenge with the kids is a great idea! Check out this challenge done by the KhanSibs here https://youtu.be/gzVAe9-staw. Hey guys I’m abbey and I’m just starting YouTube! https://www.youtube.com/channel/UCs2geP-MOo2Uvmg0FZnUnrQ Please help me get my first few subs and I will also sub to you! Let’s do this together! Hy guys…if u want to gain knowledge follow my channel .. give me a treat by subscribing our channel . hey you guys. i just wanted to share my youtube channel on here to see if anyone who clicks on the link likes it. go check it out! (you’ll probably hate it lol) but i thought id give it a try. Hey guys! check out my YouTube and I do the same! Savage MJay https://www.youtube.com/channel/UCQdSMCBwEs2rxtuZxw2FVTw …. Thanks! Thank you!What’s your channels name? Guys just a quick note update from the first message I posted some time ago for anyone that has subbed I’m working on creating new content on my channel because the current material was not planned it was more a panic get something up because my server was stolen all footage gone hours of wasted edits you get the picture. I’m thinking about starting a YouTube and wanted some advice? hey I am Lily, plz sub to my channel and I will sub to yours. I love all different types of videos. Please check out my youtube and subscribe. Hey guys, just beginning YouTube would mean the world to me if you subscribed to my channel and liked my recent video!! And I’ll do the same back to you!!!!! anyone wanna subscribe to my channel? Im not that new of a youtuber, but in need of subscribers and daily views? i was going to make a posting schuedule, only no one wants to watch, and I have zero views on my last video, and I found some editing software, so I may be posting monday. if anyone would like to subscribe to me, I will subscribe back to you! Love these Ideas!! Sub to my channel and I’ll do the same! Look up Sophia Everett I don’t have a link right now…. Check out our channel and tell us your thoughts! Thank you for the tips, I will make sure to use them!